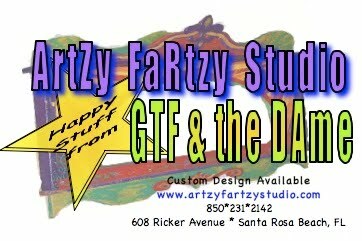 custom designed and carved gate sign. Deadhead cypress wood is deeply hand carved with the company logo and tomato vines. 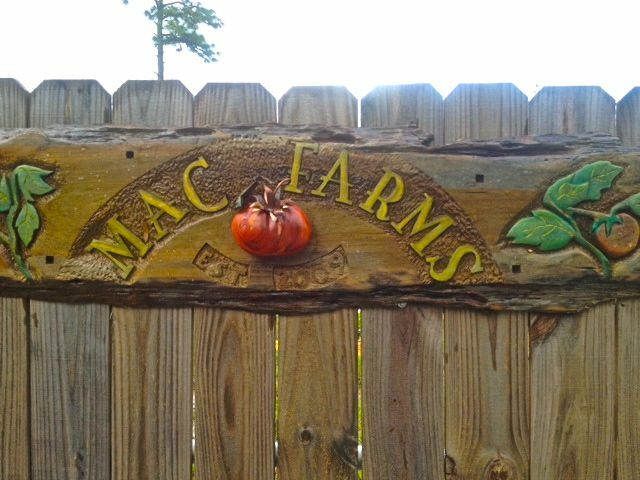 The hand sculpted wood 3D heirloom tomato (with copper vine and leaf) further honors Mac Farms delicious locally grown produce. Selective hand tinting allows the beautiful wood grain to shine through. Sealed with oil polyurethane suitable for outdoor weather, this custom sign will live to be an heirloom as the tomatoes that Mac Farms grows. 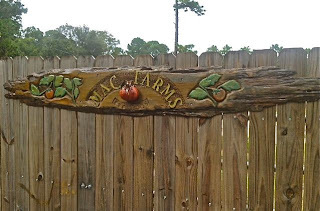 Created with Love, Honor, and Respect for Jennifer & Andy McAlexander of Mac Farms Florida.